Two new papers have just been published on the SAGE & THYME Foundation Level workshop by Dr Jane Griffiths at the University of Manchester. 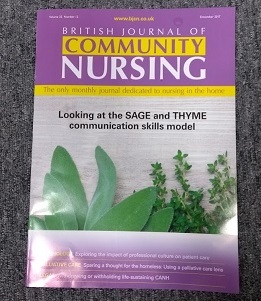 The first, published in British Journal of Community Nursing, is an article entitled 'Person-centred communication for emotional support in district nursing: SAGE and THYME model'. The second is a review in the International Journal of Palliative Nursing, entitled 'Communication in palliative care: the applicability of the SAGE and THYME model in Singapore', and was co-authored with Ang Seng Hick Martin (Singapore General Hospital) and Professor John Costello at the University of Manchester. Click on the links above to read the abstracts.